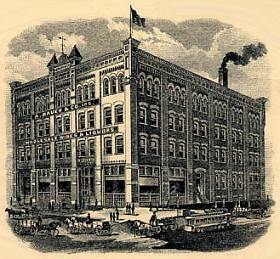 A BAUER DISTILLING & IMPORTING CO.
Bauer is listed in Chicago directories from 1893-1918, first as A Bauer & Co. (1893-1908), then A Bauer Distilling & Importing Co. (1909-1915), finally as The A Bauer Distilling & Importing Co. (1916-1918). A. Bauer, Pres. & Manager, Tucker Hardy, Vice Pres., W J Knaus, Secretary and Horace F Hardy, Treasurer (1899). "Anchor Brand Peppermint Schnapps", "Belle of Kentucky", "Dan Patch", "Graham Rye", "Old Rampart", "Sedgwick", "Sir John Canada Malt", and "Torrance AAA." Re: A BAUER DISTILLING & IMPORTING CO.